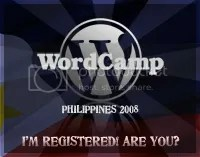 The registration for WordCamp Philippines is now online. Don’t know what WordCamp Philippines is? WordCamp in the Philippines — the first in Southeast Asia! WordCamp is the premier event for WordPress users and developers. WordPress is arguably the #1 blogging platform in the world today. Apart from the fact that it is feature-packed, highly customizable and flexible, WordPress is open source, and therefore has a large community dedicated to advancing its development. And so, WordCamp is the best venue for WP enthusiasts to come together and get updated on the latest. One of the objectives of WordCamp Philippines is to encourage more developers to use and deploy WordPress, not only as a blogging engine but also as a full-featured content management system for Web sites. Another is to increase the number of WordPress users and developers in the country. By developers, we mean programmers of WordPress plugins and designers of themes & templates. See you all on September 6, 2008!!! Hello, Ria! Thanks for visiting my blog. Hope to see you on September 6. Hi Ria, Thnx for visiting my blog. Hope to see you there on September 6.